You’ll quickly feel right at home. Ideal for weekday stays, hospital visits. Entire home near Downtown Durham. 2 Bedrooms and 1 Bathroom. Work Ready. Family Friendly. Bathtub. Washer/Dryer. Fully stocked Kitchen. Pack N' Play. Blocks. Roku. Professionally Cleaned. No Steps. Fully stocked bathroom. Comfy beds. Please see photos. Ideal for visiting families and professors, hospital stays, relo home shopping. -.7 mile to Cocoa Cinnamon, Motorco, Full Steam Brewery, and Blue Note Grill. - 1.4 miles to Duke East Campus. 1.7 miles to DPAC. 2.9 miles to Duke Hospital. - 26 minutes from RDU airport. On the edge of hipster Durham. This is a NON-SMOKING house and AREA. This duplex was totally rehabbed in 2015- floors, windows, doors, kitchen, appliances, and bath. You will access through the digital lock on the front door and enter undisturbed. We are available by text or phone. Your unique door code is sent via email 4 hours prior to your check-in time. Custom art by Durham's Best Artist, Steven Ray Miller. Be sure to read the notes and look for the hearts. His art is available for sale. This unit specifically designed for your VRBO comfort. Stellar in most ways. Donna very much enjoyed designing the living space for your comfort and enjoyment. Donna loves nature and is an avid walker. Jim and Donna enjoy exploring, live music, festivals, backpacking, and time with friends. We have two awesome adult children and two grandchildren that we love spending time with. Jim recently started F3 for workouts, which has been a blast. He is an avid podcast listener and host of Planet BoomerVille, which is a podcast for baby boomers. It is about making this chapter of life just as great or greater than past chapters. Jim is a mortgage broker and loves to talk about real estate financing and investing. If you are considering a move to the triangle, he works with some of the best real estate agents in Durham, Orange, Chatham, and Wake counties, and is happy to make an introduction. Jim & Donna supports Living Wages. The people who clean this host’s listing are paid more than a living wage. Close to downtown. Interesting urban diverse friendly neighborhood. Very cozy home completely set up for families and work. Close to downtown Durham, Duke University, and Duke and VA Hospitals. Coffee shop, brewery, music, and restaurants are .7 miles away. Fully stocked with high-quality Costco shampoo, conditioner, body lotion, and body wash. Extra toothbrush. Under the sink are the first aid kit, laundry soap, and dryer sheets, hair dryer, sanitizing wipes. Close to downtown (1.2miles). Some guests walk, others ride rental bikes (Lyme Bikes) or Uber. Cocoa Cinnamon Coffee is .7 miles away along with restaurants and music clubs in the same blocks. All sheets, pillow cases, towels, wash clothes, blankets and extras. See photos for details. Soap under the bathroom sink. See photos. Laundry soap and dryer sheets under the bathroom sink. ROKU. Bring your passwords and login's. Soap is under the kitchen sink. Keurig with different coffees. Teas and Electric Hot Water Kettle. Basic items - cooking spices, and salt, pepper. Plenty of dishes and utensils. There are also some yellow trays and cups for children. Fully stocked: toaster, electric hot water kettle, crock pot, pasta pot, saute pans, mixing bowls, blender, cutting boards, trivets, etc. The cupboard is stocked with most condiments you will use. Table seats 4. A booster seat is in Bedroom #2 closet. Samsung smart TV with ROKU. Bring passwords and login's. No cable. A few children's books in the back bedroom. Duplo blocks. Etch a Sketch. This is one floor with easy entry from the driveway. No steps. This is a family and business friendly home. This is a great place - just as cute in person as in the pictures, comfortable, and convenient for many things, like getting to Duke! Jim and Donna's property was perfect for our weekend in Durham. Two couples were in for a three-night run of concerts at DPAC, so we wanted the conveniences and space of a home. We chose their place because of its proximity to DPAC, and quickly realized how close we were to everything else: the greenway, coffee and dining, shopping, and yoga. We rode our bikes frequently--and the greenway is a nice (and FLAT) way to get to all of those conveniences. The home is perfect: all completely redone, fresh, and clean. It's well-equipped--you can tell Jim and Donna have thought of EVERYTHING their guests might need. We were very comfortable in this beautiful duplex. We met the neighbors, but never heard them. The neighborhood is transitional--it's definitely on its way to being the next healthy area--but we always felt safe and everyone we saw in the surrounding homes greeted us and were friendly. I highly recommend this rental for your time in Durham. WAY better than a hotel in price, cleanliness, and convenience. Nice, big, clean place had everything. Good value. Thanks so much Ivan! Appreciate you choosing us and hope you visit to Duke and Durham was super. This was a great place to be close to downtown and near a walking path in a renovated area of Durham. The house was clean and easy to access with all of the amenities necessary for a comfortable visit! This home is fresh and clean and perfect for our family of 3. Jim and Donna have thought of everything, including cold water in the refrigerator, which was perfect after a long day of travel. The home is in pristine condition. We loved that a booster seat and pack and play were available, so that we didn't have to pack ours. Our son loved playing with the toys that were provided and running up and down the long hallway. 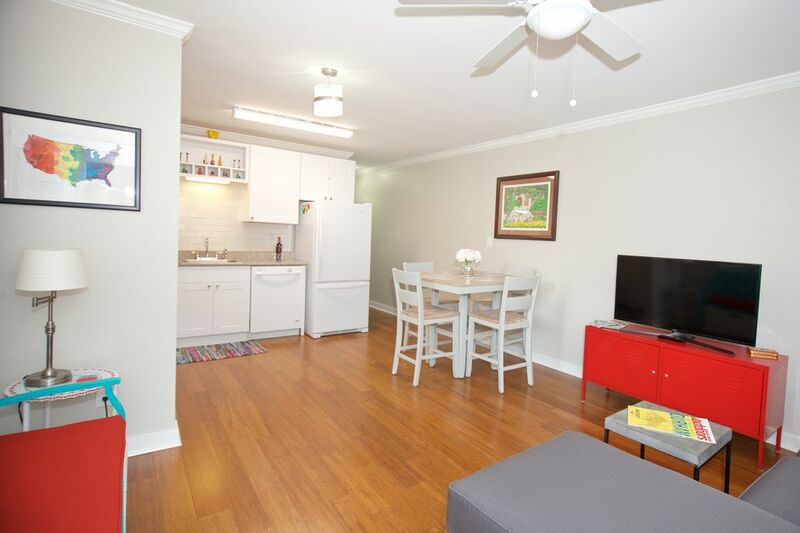 This home is the perfect location for visiting all of our favorite spots in downtown Durham. There are parks, shops, and restaurants nearby, which made travel easy with a small child. Jim and Donna were very quick to respond to any questions that I had before we arrived and left a detailed welcome book with instructions for the house and activities to do while we were there. I highly recommend this home to anyone who is looking for a getaway to Durham, North Carolina. Museum of Life and Science.